We have a number of cats who live at the Cat Clinic. Some of these are permanent residents and the Clinic is their permanent home. Others are temporary residents, in search of a good home. 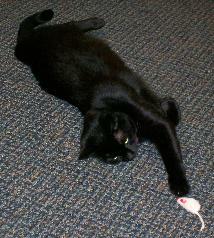 The resident kitties searching for compassionate owners are featured on our PetFinder Page. Below are a few short videos of our clinic cats both past & present. 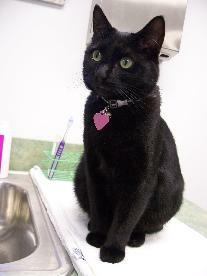 Jesse was a small, injured kitten when a good Samaritan brought him to the Clinic. His back legs did not work He had lots of physical therapy, electro-muscle stimulation and acupuncture trying to get his back legs to work normally, but that was not to be. Although his back legs may not work he never lets that slow him down. He's always cheerful and loves to play with other cats, especially kittens. He often greets Clinic patients when they arrive. Cassie sometimes acts the part of the aloof princess who knows that her human subjects are a bit beneath her. However her curiosity often gets the better of her as she keeps a close eye on all activities in the Clinic. Cassie has a number of preferred observation posts throughout the Clinic and has been known to be a bit casual about the items she breaks in reaching her favorite high spots. If you should find that we're sold out of a particular cat toy, Cassie frequently has these in her private stock.